Home > Blog > When Do Sore Throats Become a Serious Issue? Sore throats are quite common in kids. However, it is difficult to figure out the root cause of sore throat, whether is caused by serious infection or just a normal symptom. There are a few common infections that accompany a sore throat. Common cold can lead to sore, scratchy throat, which can cause your child to have cough, runny nose and fever. In case of viral infections, antibiotics may not be helpful. They get better on its own within a week or so, without any medication. Make sure your child gets sufficient rest and plenty of fluids. Enteroviral infections commonly spread among children during falls and summer, although it may occur throughout the year. Early symptoms include sore throat and pain, followed by small blisters and red bumps, particularly on buttocks, feet and hands. Sores and blisters may form in the throat and mouth, making it hard to swallow. Again, antibiotics don’t help in case of viruses. The bacterium Streptococcus pyogenes is the leading cause behind strep throat. It is commonly seen among kids during spring and winters. Some of the symptoms include swollen glands, fever, difficulty in swallowing, pus on the tonsils and sore throat. Children may also complain of sandpaper-like rash on the bodies, stomachaches and headaches. It is extremely rare to find such condition in toddlers and infants. An ENT physician will prescribe antibiotic medicine for strep throat. Why Should You Know The Difference? Viral infection is the root cause behind sore throats, which generally goes away on its own without any antibiotics. However, it can reduce contagiousness, accelerate recovery time and reduce the risk of developing certain complications from strep throat. One of the most important complications to avoid include acute rheumatic fever, a disease that can affect joints and heart. Antibiotics play an important role in treating infections, but have their own risks, including allergic reactions, yeast infections and diarrhea. This is why it’s necessary to know when antibiotics may be required or not. When To Take Serious Action? 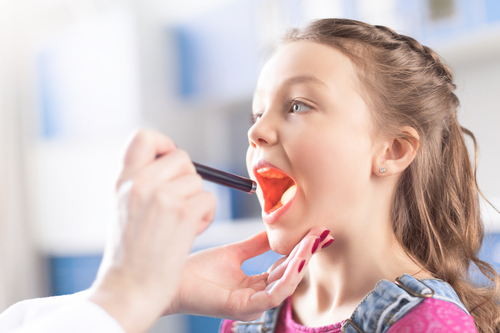 If your child does not recover from a sore throat over the course of the day, particularly after drinking water, you should consider calling a pediatric ENT profession. This is of high priority, especially when there are signs of dehydration, drooling, stomachache, headache and fever. You may have to go for a physical check-up to determine whether a strep test is required or not. In case the pediatrician thinks that the child does not need a throat swab or he/she tests negative for strep throat, then you are all good. Most probably, there’s some viral infection that will go away on its own. In case the condition is persistent for 4-5 days, or new symptoms come into play, he/she should go for a physical checkup once again to determine if any other test is required. At ENT for Children, we provide comprehensive treatment packages to ensure your child is cured of serious conditions, before it turns into something worse!